“Ulster Unionist MP for Fermanagh and South Tyrone Tom Elliott criticised the state funeral for Kent who was arrested at his home after a Royal Irish Constabulary officer was killed. The British-apologists who populate the worlds of Irish journalism and academia seek to create a false equivalency between the history of those who fought to regain their freedom and those who fought to deny it. There is none. The demagogues of British unionism in Ireland remain in 2015 what they were in 1915, or 1916: fascists, bigots and colonial supremacists. I’m a vulgarian, so I’m not going to say what I want, but once again, you’ve nailed it. Superb. Well Séamas, did anyone ever expect a different reaction? The UUP, saying politely what the DUP and TUVwould love to say in more robust terms, could have kept their mouths shut – but Unionists desperately have to nit-pick everywhere to prove they’re better than republicans/nationalists – no matter how shabby and petty they appear/are! They have to get their view across. I agree. A bit of generosity on both sides of the great divide would do no harm. I see nationalists reaching out but will unionist leaders attend the 2016 events? A quick throw in there Go snasta agus go gasta Short and ………..well………sharp! I think the key to this is that Tom Elliott as a newly elected M.P. wants to appear as visible as possible and , therefore, occasionally states the blindingly obvious, i.e. Unionists don’t like Republicans, even Republicans that have been dead for almost a century. By the same token, of course, Republicans don’t like Unionists, as this blog so amply demonstrates. Incidentally, I don’t think that Mr Elliott, a prosperous Fermanagh farmer, could be classified as a member of the lumpen proletariat, that would be the inhabitants of the Shankill, Sandy Row, Ballymacarrett, etc, they can happily be classified as such and then patronised and sneered at. So happy future sneering! Ginger, in fairness Elliot may be a newbie MP but he is a veteran politico in the UUP and Irish politics in general. He was the UUP leader for two years. Personally I have no particular objection to poppy-wearing, WWI or WWII monuments, remembrance day ceremonies, etc. that seem to irk others. Quite the contrary. I think the thousands of Irish dead from WWI, etc. should be remembered and unionists are perfectly entitled to do so in whatever way they wish. SF and Irish government ministers attending the cenotaph, etc. is a good thing. However when there is no reciprocation, when there is only insult, then it makes one less generous in thought and action. Which is a bad thing. I’ll admit, I wrote that post with quite a bit of disgust. Weren’t the RIC mostly unarmed police force staffed by local Irish people? A load of BS you’ve swallowed from the daily mail. Did you read the blog’s posts on the RIC you Hibernophobic prick? Most of its members, like the collaborative police and security forces in German or Soviet occupied Europe, came from the domestic population. Not true. The majority of RIC constables and officers were routinely armed with handguns, worn as part of their service uniform. It was rifles and carbines that were carried intermittently (for instance on some court days, property evictions, during political demonstrations, etc.). From late 1919 onwards most RIC men were armed with long and short weapons when patrolling, as they were during the Easter Rising, the Land War, etc. Despite their armed status, constables seldom carried guns, only waist belt, handcuffs and baton. Often, along with the priest, they would have an informal leadership role in the community, and being literate would be appealed to by people needing help with forms and letters. Don’t believe everything you read on Wikipedia, Jānis! 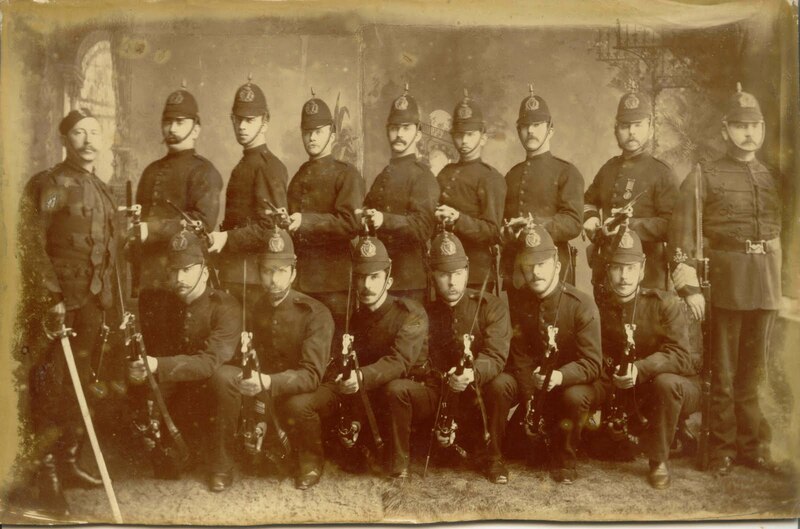 The majority of RIC constables carried side arms when on duty as part of their uniform. It was long guns (carbines or full rifles) that were optional, usually only issued for specific tasks, at the discretion of the local sergeant. The partisan testimony of two sons of former RIC constables saying their fathers rarely bore guns until post-1916 and quoted in an “oral study” does not make the claim any more factual for the whole force. The weight of evidence from contemporary accounts makes it clear that RIC men were normally armed. The rest is true, RIC men were frequently the only literate members of the community. The rising levels of literacy and greater educational opportunities was one of the (many) contributing factors to the Irish revolution. While I understand resistance against Blacks and Tans and the British army – attacks on the RIC just seem wrong. It’s amazing what you learn in here every day isn’t it? Presumably a strong police force arresting a rebel “gang” would expect armed resistance. The presence of the head constable shows that it wasn’t some poor eejit that the Kent family took unawares too. In some ways the war of independence was tough luck on RIC members but then again they were the ones who enforced evictions, broke up land league meetings, did the bidding of landlords and magistrates, etc – you can’t play every side. Partisans in every war have found it hard to deal with collaborators and their multiple motives. Very few of them were assassinated out of hand in the war of independence anyway. That would have been something the Irish public wouldn’t have accepted. There was a tacit understanding in many rural areas and as a general rule only those that crossed unwritten lines were liable to be killed. RIC stations that were kept as stronghouses in republican dominated areas were legitimate targets as were those who took money to man them.